Irish eyes are smiling in Chantilly. IRISH TRAINER AIDAN O’Brien celebrated a podium sweep after Found won Europe’s most prestigious horse race, the Prix de l’Arc de Triomphe, at Chantilly on Sunday. The four-year-old Irish filly, saddled by Ryan-Lee Moore, kicked with four furlongs to run to convincingly win the Arc, the richest race in Europe with €5 million in total prize money. Highland Reel and Order of St George came in second and third to round off an outstanding day’s racing for O’Brien, whose sole previous Arc victory was by Dylan Thomas nine years ago. Pre-race 2/1 favourite Postponed came in fifth. 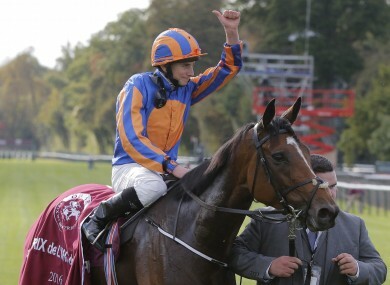 “It’s a great feeling to saddle the first three home in an Arc, there’s not much to beat it, but it’s all down to a fantastic team effort and I’m delighted for (owners) John (Magnier), Michael (Tabor), Derrick (Smith) and their families,” O’Brien said. “And what makes it amazing is that they are all by Galileo,” he said of the retired Irish thoroughbred he used to train but is now an active sire. O’Brien added: “It’s a privilege to be here and be part of it. How can you see anything higher (in his career) than this? “I couldn’t dream this would happen. You know how difficult the Arc is. “She’s only run over a mile and a half four times before and she was unlucky in the Arc last year. “Epsom (Coronation Cup) was also a falsely-run mile and a half, and we came here very hopeful after a good run last time. Reaching speeds of up to 60kph over the tricky 2.4km (1½-mile) Chantilly track, hosting the race while Longchamp undergoes much-needed renovations, Found was not among the early pace-setters led by Vedevani, touted Japanese runner Makahiki and Highland Reel. Order Of St George, ridden by Frankie Dettori, moved up into second behind Vedevani with The Grey Gatsby third and Postponed wide in fourth being tracked by Left Hand and Makahiki. But as the horses hit the home stretch in perfect conditions at the racetrack north of Paris, Found acclerated through the jostling field along the inside rail with Highland Reel on her coattails and found herself with a free run-in to the line. Found’s victory ended a run of five successive runners-up spots in Group One races including being beaten by Postponed in the Coronation Cup at Epsom in June. But the filly, listed at 6/1, had run a superb prep race for the Arc in finishing second in the Irish Champion Stakes in September. Email “Incroyable! 1-2-3 for Aidan O'Brien as Found wins Prix de l'Arc de Triomphe”. Feedback on “Incroyable! 1-2-3 for Aidan O'Brien as Found wins Prix de l'Arc de Triomphe”.